It’s no secret that college tuition is high. In the 2012-2013 calendar year, full tuition at the college, including room and board, reached $55,750, but $57,850 has now been determined for the 2013-2014 year. Full costs have increased annually by about 4.4 percent over the last decade equating to an approximate $2,000 increase each year over that timespan. Suzanne Welsh, vice president for finance and treasury, explained that the budgeting process begins in the fall when each department of the college reviews its specific needs and submits a budget request for the following year. The president’s staff review all the requests and forwards them to the president. Welsh, however, searches for information from a variety of sources in order to make decisions about how much tuition for the coming year will be. Welsh further noted that The College Budget Committee (CBC) meets periodically throughout the process too. Even so, concerns from students have been raised about the ever-increasing prices. Jesse Bossingham ’16 is concerned about where tuition money is going. 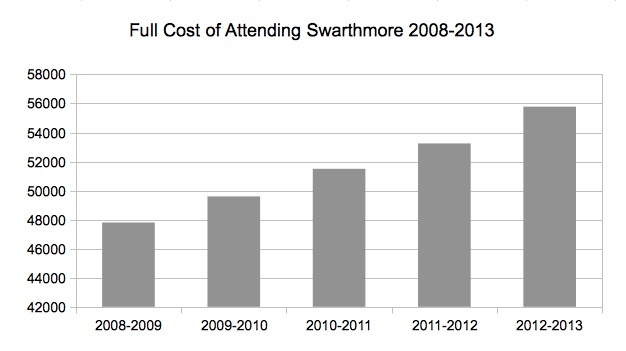 Welsh noted that Swarthmore’s increases are in line with those of a comparable group of selective private institutions and that often the cost had actually been lower. Looking at comparable liberal arts colleges, tuition appears to be similar across the board. Amherst College costs $57,970 per year while at Haverford costs reach $59,446. Middlebury College totals $57,075 while at Williams, the cost for the upcoming year will total $59,712. The standard comprehensive charge made to each student for tuition at Pomona is $54,964, $786 less than Swarthmore’s. Notably, none of these costs include books, personal items or travel expenses. Though financial aid mitigates monetary stress, some students don’t feel that the assistance they receive is enough. A member of the class of 2014 who chose to remain anonymous because of his financial aid situation explained that even though his family received help from the school, sometimes the money just wasn’t enough. He explained that his parents had been forced to dip into their retirement accounts, as well as forced to ask extended family for monetary aid. On top of this, by his sophmore year his parents had also asked him to take out a student loan. Welsh, though, noted that the College is committed to maintaining access and affordability. Alexandra Willingham ’15 serves on the College Budget Committee, (CBC) which gives students a glimpse of the college’s budget and finance policies. Although she and her fellow members are required to respect the confidentiality of the reports, from her experience serving on the committee, she believes that the college’s decision to raise tuition fees is justified. Welsh also explained that tuition and endowment provide 90 percent of the revenues in the annual budget.